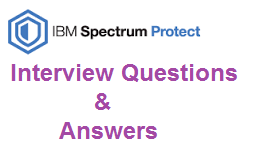 This is the continuation for the previous post IBM Spectrum Protect Basic Interview Questions. If you need to learn IBM Spectrum Protect freely visit the page Tivoli Storage Manager Tutorials. You can also find the basic Video Tutorials at TSMtutorials.com Youtube channel. 16) Common reasons for Tape Library issues ? Has the host bus adaptor Or scsi adapter connecting to the device updated or replaced. 17) What to do if drive goes offline ? Update drive libraryname drivename online=yes. If it is not coming to online then do power cycling means power on/off. 18) How to check the actlog for hardware errors ? 19) What to u do when the drive paths are offline? 20) How to define a library ? 21) How to define a path for library ? 22) How to define drive ? 23) How to define drive path ? 24) How to checkin tapes into library? Yes: server searches inside the library for volumes that are to be checked in. Bulk: server searches for the library I/o ports that are to be checked in automatically. 25) How to checkout tapes from library ? checkout libvol libraryname volumename remove=yes/no/bulk. 26) How to Label a volume ? 27) How to define a device class ? 28) How to audit library ? If checklabel=barcode, then it will audit by using only checking barcode labels, if you specify YES, it will read the inside the label of each tape volume in order to audit the library. 29) How to Audit volume ? If you use fix=yes, then TSM will delete the data which is corrupted and if you use fix=no, TSM will only report the damaged data information but will not delete it. 30) what will u do when the library is full ? Otherwise use move data command to move the data manually. Start reclamation and see if it generates any scratch tapes. Check out all the primary storage tapes with status=FULL to make room for scratch tapes. 0 Comment to "TSM Tape Library related Interview Questions and Answers"